Menstruation was a mystery before science could explain it. So, a lot of different ideas and beliefs were created to explain periods in ancient societies and cultures. Many such ideas and beliefs have been proven wrong by Science, but they are still followed in current societies. We call these ideas menstrual myths. 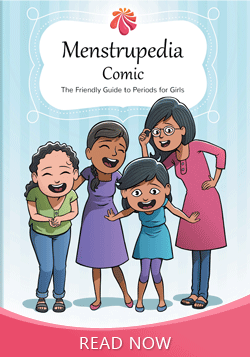 These myths tend to suggest that menstruation is a disease or a curse and it leads up to beliefs like a woman's body is polluted when she is experiencing periods. Such beliefs cause discrimination against women and at times, can lower your self-esteem and opportunities for growth. We find this situation to be a problem for a society in general because women are the 'better half' of every society.